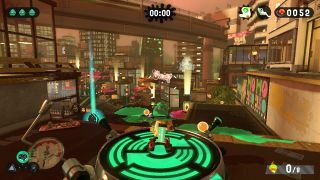 The Reef is a multiplayer stage in Splatoon 2. 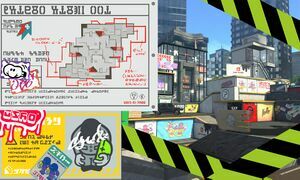 The Reef is located a few blocks from Inkopolis Square, it's a popular area to hang out when it's not being used for Turf War. The Reef is home to some of the most popular boutique shops in the city. The Reef features many wide open areas, with separate high and low levels. This creates many flanking paths around many of its key areas. 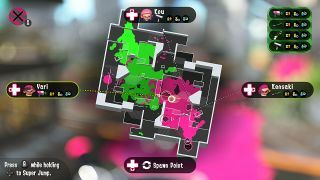 The base is not accessable to the enemy team and includes a path which allows easy access to the far left and far right side of the map. Dropping from the base is a small square raised area that leads into the meat of the map. Notably there is a stone bridge at the center of the map which acts as a straight path into the enemy area. The map also boasts a large grass lot below the bridge, with a tree and a block as obstacles. The area underneath the bridge indents downwards and the turf is inkable. The reef is a plaza that is built below ground surrounded with shops. The walls of the map are large windows displaying various goods. Many tarp posters advertising various ads and graffiti covers the walls and windows. The floor are concrete and mason pathways, with the side areas painted as a parking along with a car on each side. Fence gates with barbed wire on top are lined against walls in some areas. Vending machines, skateboards, and bikes line the walls near the spawns. At the sides are cafes and bars with jellyfish serving inside. On the top of walls and the are various potted plants, and the center of the stage is are patches of grass with trees planted in, with a large stone bridge crossing over it. Various light posts with banners are strewn across the map. A large pool of water is found bellow the left path from the spawn. Outside of the playable map are trees planted on the sidewalk and skyscrapers of various colors and patters. The Ferris wheel from Wahoo World can be seen behind Team Bravo's spawn. 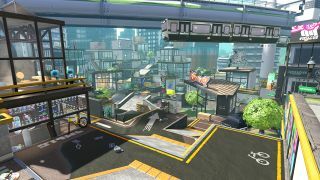 In Splat Zones, the zone can be found below the bridge. Boxes have been added around the bridge to help teams attack players on the bridge and gain control of it and the zone. The tower initially starts below the bridge. When advancing, the tower goes left and retreat back to your side, going around the tree before advance back towards the enemy base. It will travel up the ramp and up into the small square lot in front of the enemy base where it will reach its goal. The first checkpoint is located just left of the tower's positon. The second checkpoint is located next to a tree when it retreats back towards your side. The third checkpoint is located after it starts heading back towards the enemy base just before the homestretch, still in the grass lot. Like the tower in Tower Control, the Rainmaker starts below the bridge in the center of The Reef. Each goal is located next to the car in each base. Several ramps have been added that give each team access to the other team's base. The basket is located below the unaccessable area of the base and there isn't any bump near it. There is a new block in the right side of the bridge to get above the wall. Much more flat surface at the center of the stage. Wooden bridge instead of raised grate bridge with a wooden box in the center. Pots instead of bumpers in each side's platforms. Two trees in each side of the center instead of one. Pre-release version of The Reef. The Reef was released with launch of Splatoon 2. 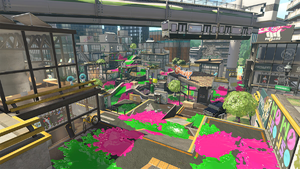 Mission nine of Octo Canyon, Octoling Strike, takes place on a modified layout of the release version of The Reef. This layout remained the same after the release of the updated version in 4.2.0 update. The image released on social media announcing changes to The Reef. Areas around the teams' spawn points were deepened and widened, which will allow easier recovery from spawn camping. More passages added from the spawn points to the flank areas. The buildings surrounding the central area were moved back, making it larger. Splat Zones: Increasing the number of splat zones from one to two. Tower Control: Very small modification to the path of the tower. Rainmaker: Moved the Rainmaker's location from below the bridge to on it. Clam Blitz: Moved the basket to the side and added a bump. 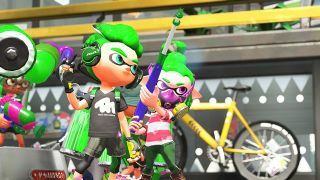 Inking the trees growing in The Reef and Inkblot Art Academy stages will no longer earn points or fill the special gauge. Fixed an issue in The Reef causing Suction Bombs and other objects thrown onto the area around the central bridge to sink inside it. Fixed an issue on The Reef in Rainmaker and Clam Blitz in which players could enter the opponents’ base without using the main route. The level immediately below spawn has been extended, with an additional path branching to the right. The small raised square area towards each team's area is now connected to the area with the parked car. A sponge block in each team's corresponding color has been added in its place. The area with the parked car no longer has a ramp that leads into each team's base. The halls off to the side now include an additional drop off. Release version of The Reef. 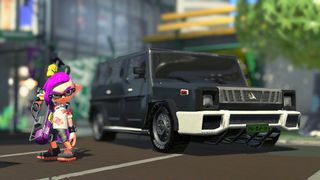 Custom E-liter 4K Scope near the car in The Reef. Octoling Strike mission in Octo Canyon. The internal codename for this stage in the game files is "Ditch". 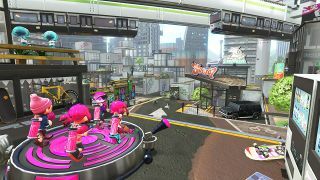 The updated version of The Reef from Version 4.2.0 also changed the fashion posters displayed on the stage, now featuring Octolings and Inklings with new clothing, appearing on a black background with red text spelling what seems to resemble "17XX" as seen here. 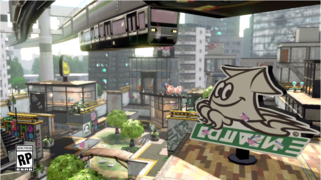 Previous versions of The Reef had posters of Inklings with different clothing and a white background as seen here. A reef is a habitat for animals and land-dwelling organisms, popular area that attracts a diverse assemblage of organisms, especially algae, and fish. In Splatoon 2, The Reef is a popular area for Inklings to hang out when it's not being used for Turf War and home to some of the most popular boutique shops in the city. battera sutorīto Battera Street, battera is a kind of sushi (oshizushi), "pressed mackerel sushi". This page was last edited on 13 April 2019, at 16:00. This page has been accessed 29,262 times.